Gmail does support only plain text email signatures. An HTML signature is much better than a normal plain text signature because you can add lots of formatting to make your signature much more professional looking. To create HTML signature in gmail, just follow these steps. 1.Log in your Gmail account. 2Click setting and select labs. 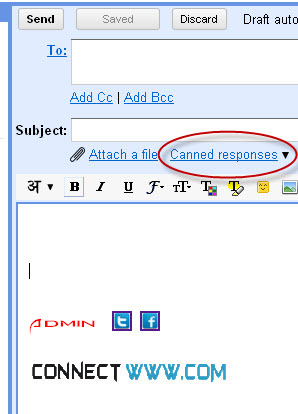 3.Enable Inserting images and Canned Responses and save changes. 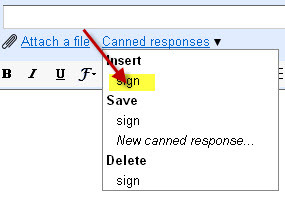 6.And click New Canned Response and name your HTML signature. 7.Now whenever you are composing a new message,just click Canned Responses and insert the relevant signature and it will be inserted. Hello, my group is just establishing our first website, searching and working out what is needed. This blog stuck out right away. I¡¯m fired up about this, and adore the design of your site. Are you able to let me know what ¡°theme¡± it is? Wonderful article, a bunch of valuable material.